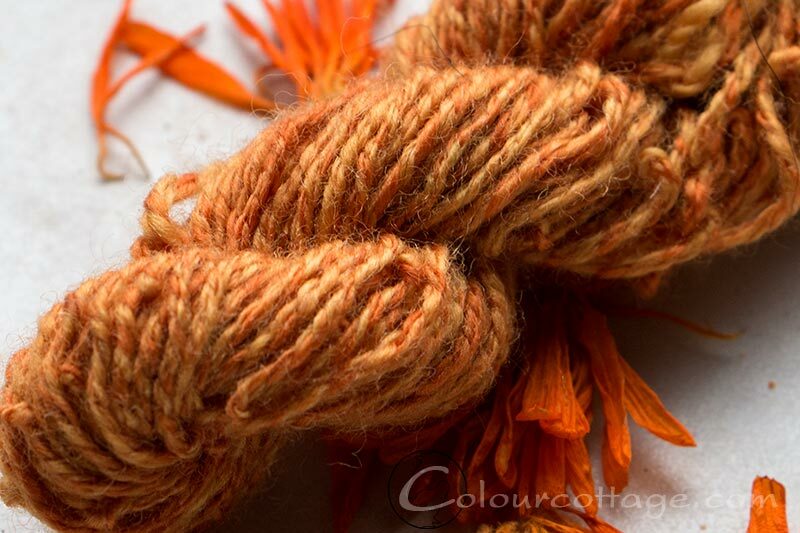 Originally this post was drafted to show and talk about “designing” yarn. (see how I had to put that into quotation marks, so as not to come off too presumptuous 😉 ) And then as usual I got sidetracked from the yarn ideas I had so they still live in my head. 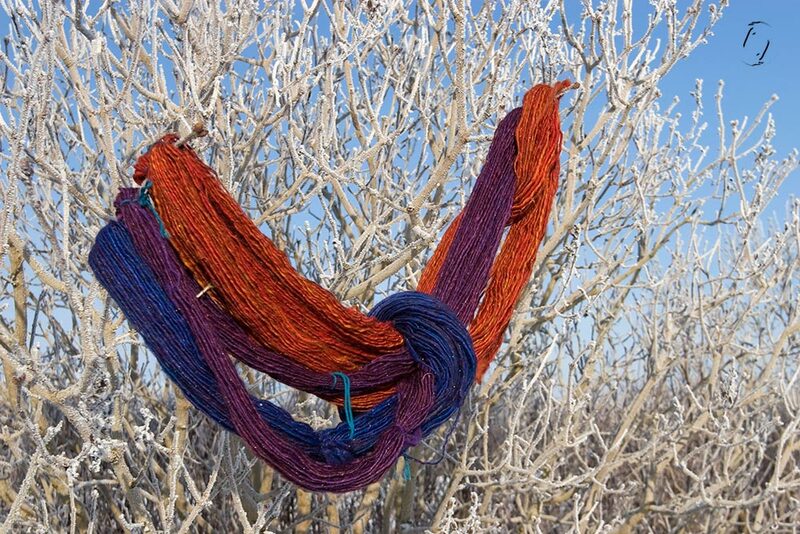 The funyarns are figments of my imagination, not so much planned for or even suitable for knitting, but spun just because. Because the colour concept appealed to me, to resemble something I’d seen (such as the half done rowan tree yarn), or just to experiment. I won’t call them art yarns, because I’m just not that good. 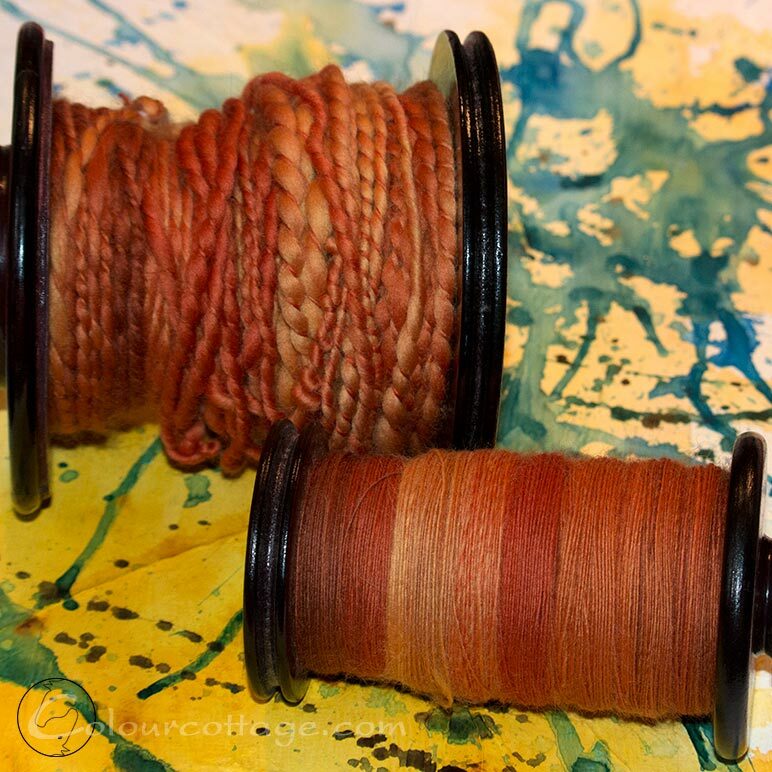 It’s not that I don’t enjoy spinning yarn for a purpose, but it’s a different joy. 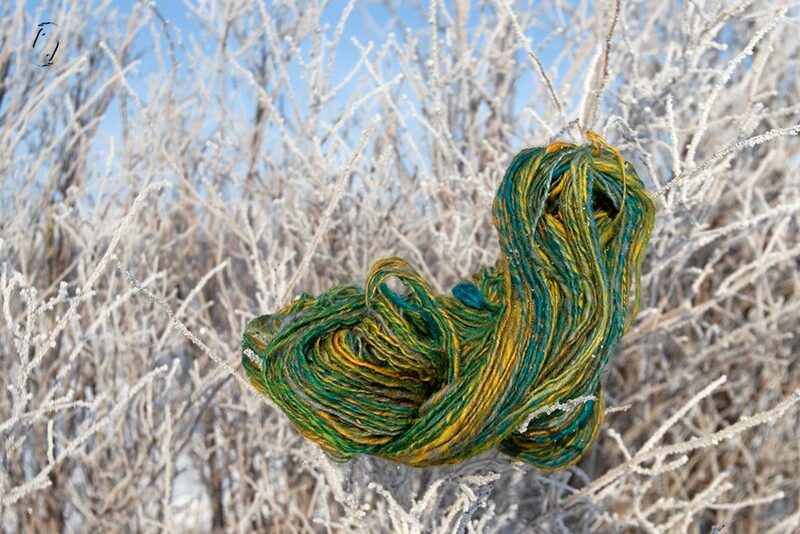 Funyarns are really more like painting. So anyway, I’ve spun almost a pound of wool in the last couple of days for absolutely no purpose at all, it’s colourful and random, so I thought I’d kick off this category now and keep adding once in a while. It started out with a challenge on Ravelry, theme “Safari” (which incidentally was my own suggestion). I had a couple of batts that I bought a long time ago before I knew the difference between a real woolen prep and “just” combed top blended on a drumcarder, still running perpendicular. One is not better than the other, just different spinning, different purpose. I thought one set of batts looked quite like a piece of rainforest, so off I went spinning a fat single. I have all sorts of things going through my head while I see the fiber run by my hands, goes something like this: “I wonder if I should have included some pink tufts for orchids in a jungle, no, all that yellow is enough. So would this resemble the amazonas rainforest or this turquoise, where do they have those mineral lakes in old sinkholes, Indonesia? Hmmmm, this is turning out a bit muddy and earthy, a bit Mexican inspired colouring with the strong greens and yellows? Do they have jungles too? I should make some South American themed colourways. And Chinese inspired drawings (oh, don’t be silly, not in this lifetime. I thought you wanted to be the new Otto Frello?). And definitely look up something on Celtic symbols as well as old Scandinavian. And do a palette of the garment colours used in various times in Europe for some project. But something oriental would be cool too.” Yes, that IS pretty much what the inside of my head looks like more often than not. Turned out much more blended than I wanted, I liked the batts better than the yarn, but such is the way of those things. In any case I decided to spin ALL the batts to practise getting that thickness. Whoosh! All gone, one empty box. And the red and purple with gold thread took me on a trip to India, so around the world in a few hours isn’t half bad, is it? I must be getting better at it too, since each yarn ended up shorter than the previous colour. I don’t normally thwack my yarns, because I don’t want the halo, but these got a severe beating because I wanted them to felt a bit and bloom as much as possible. Which leads me to my second mission: fiber stash bashing. When I first started out I bought all sorts of random stuff to try out, then I had a bad spell and didn’t spin for something like 8 months and now I just want something completely different. I still love to OGLE all the pretties that are offered for sale on Etsy, but I do love to make my projects from scratch, i.e. 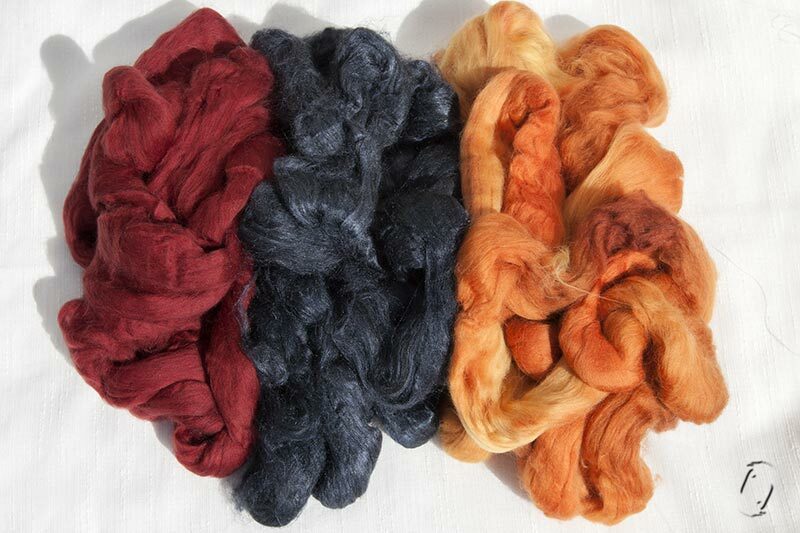 dyeing my own fiber. I also need more space for my paint supplies now, so I’m going to try to spin all that random fiber and in the future keep just a stock of undyed fiber in a few varieties that I like. This was originally named Sea & Sand when I dyed it – but it actually could go in the savanna category all spun up, yeah? Smallest braid spun this week also. Jeg kunne godt tænke mig at tømme lidt ud i mit fiberlager, så jeg kun har ufarvede fibre i mine yndlingssorter liggende. Dels mangler jeg plads til andre hobbyting, dels fordi mit fokus har ændret sig lidt siden jeg begyndte at spinde. Og da jeg har rigeligt med strikkeprojekter på venteliste, vil jeg bruge den næste tid på at spinde garn som ikke har noget formål, men bare er skægt, har en flot farve eller fordi jeg har en tosset “design”ide. Så jeg startede med en fletning jeg selv havde farvet, i superwash BFL. Bagefter kom turen til Ravelrygruppens februarudfordring “Safari”, og da jeg var godt i gang med at øve tyk single tog jeg lige de resterende batts i den kasse fra samme leverandør, købt den gang jeg ikke kendte forskel på rigtigt karteflor og kæmmede fibre kørt en gang på kartemaskine for at blande farverne let. Det gik let og gesvindt, og hvert garn blev lidt kortere end det forrige, så lidt bedre til at spinde tykt blev jeg da, selvom det ikke er super-bulky. Normalt tæver jeg ikke mit garn, for jeg kan bedst lide det glat, men singlerne her har fået rigtig mange bank, så de kunne filte lidt og puffe så meget op som muligt.